I've heard that it's bad to let clay freeze. It doesn't get that cold in Portland very often so it's never been an issue before. Let me just settle any doubts in anyone's mind. It is bad to let clay freeze. 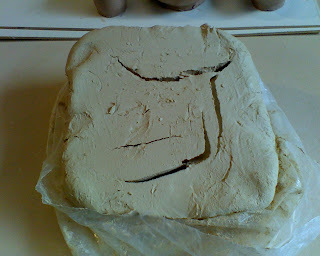 On Saturday I tried to throw from a block of clay that sat in my car during Snowpocalypse 2008. The ice crystals caused huge cracks to form through the middle of the clay (or that's my theory anyway). I couldn't just mush the clay back together, there were tons of air bubbles all through the clay, which will require a huge amount of wedging (like kneading) to remove, and I'm a super bad wedger. In case you don't know - air bubbles are bad. They make it really hard to throw because the clay gets all wonky and off-center, plus they can blow out during firing. Best case, it cracks the piece. Worst case, it takes out other pieces with it. Grrr.